So—I am in that expected and frustrating “plateau”. I’ve tried moving the weights up, have given up vanilla yogurt–actually makes me feel sick to eat that sugary stuff now! I didn’t think vanilla yogurt was a big problem. I was losing weight and eating at least a large tub a day! My trainer asked what i was eating, and I think i stunned him with that amount of yogurt–he was actually speechless while I was doing my leg curls–and when i asked why he was so quiet –it was becaue he was having trouble conceiving of one person eating that much yogurt—I was a bit miffed at first but DAMMIT he is pretty well always right—i was downing SUGAR!!! 6 1/2 teaspoons in one cup of vanilla yogurt! I stopped–although it took a month to wean myself off, and now I eat only a cup a day–with lots of fruit-because–let’s face it– plain yogurt is horrible!! No weight off for 6 months! Am I going to give up? NOPE—-I am feeling great and buying earrings! Earrings– instead of chocolate. Clothes, work out pants, and necklaces. My 87 year old mom was thrilled to see me in jewelry. Still not too comfortable wearing earrings—my poor ears just can’t take it–and I have to take them out to swim—more trouble than they’re worth really. But it stops me from buying chocolate. I had a COSTCO cone about 6 weeks ago and I didn’t like it!–It used to be the BEST cone ever! It tasted like lard! I have been to Costco a few times since and don’t even look at the cones now…..I keep hoping that this is a sign that my taste buds are changing. Am I sticking with my trainer—YEP. Bottom line is–I know the odds are stacked against me–and if I have to spend a few thousand a year to stay in shape, enjoy life and keep the ability to work–it is well spent. I don’t smoke or drink so “I’m worth it”! Can I do it on my own?—maybe–but that couch is mighty tempting! And I have failed too many times on my own!! …and when you had normal weight, overweight and obese people–the DEATH rate for obese people (not morbidly obese), was the SAME AS NORMAL WEIGHT PEOPLE if you did all four healthy lifestyle habits. So 15 months with trainer–I have gone up in strength quite a bit, but still have a long way to go. I just hope my ISUS (remember that screwed up weight sensor) will allow me to lose a bit more! I have settled into a 2 hr a day most days (up to 5 hour a day on Tuesdays), at the gym, and feel pretty comfortable working a circuit all by myself. I swim 6 hours a week and do weights 6 hours a week and usually a couple of aerobics classes. I can leg press 620 pounds, leg curl 100 pounds, thigh squeeze 210 pounds, and straight leg dead lift 110 pounds–so am way stronger than that first killer “lift your own leg” phase. I don’t feel intimidated by guys at the gym—most have their own personal issues and demons they are dealing with–and most are just regular joes just wanting to stay healthy. I get guys coming over and telling me they are impressed by my progress–so that is nice to hear. I have also learned to say ‘THANK YOU’ instead of just looking down and away—not used to hearing compliments in a few years! I also try to give compliments–those guys need positive feedback too!…even the extremely fit ones are chuffed to get some acknowledgement of their hard work! And–when you see a man or woman with muscles–believe me—they are hard earned! I am just glad the run is over! I really think i would rather swim for two hours than run for an hour! Also I have been scared to death of the #2 situation when running! Hearing that people just crap as they are running just totally disgusted me!! 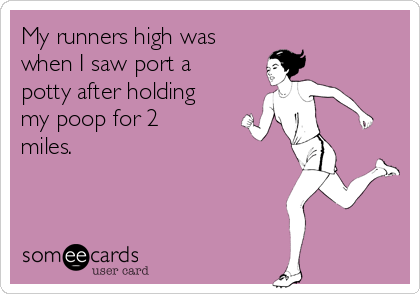 Like in what run is your time so important that you crap while running!!!???? 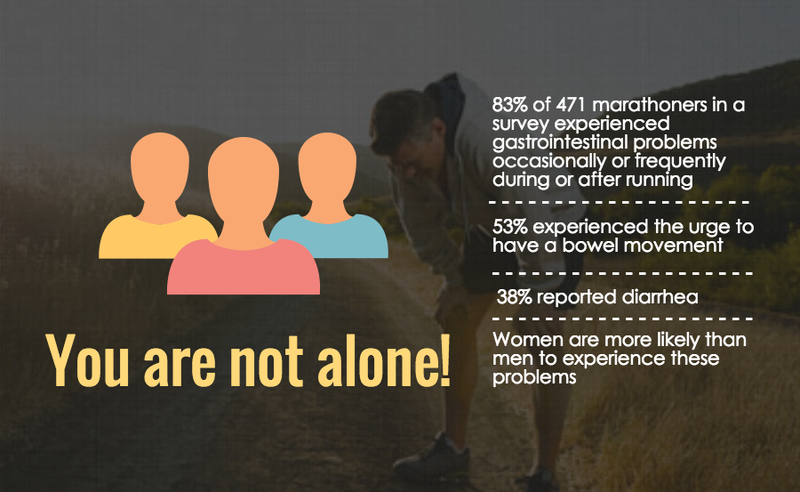 I heard all kinds of advice before my first 10K —and had taken the ‘recommended by 4 out of 5 runners’ laxative the night before, and got up early and ran a km—NOTHING HAPPENED!!! THE TOTAL OPPOSITE OF NORMAL! This is not one bit comforting!!!! Now—-I had to get on the bus and head to the start line. Oh MY GOD—I am in panic mode, and popped two Immodium tablets as I get on the bus, and had 2 more with me–thinking i am going to pay dearly for this event. I was assured there would be portapotties along the run—THERE WERE NONE!!! There were two at the start line—that’s it! LIke people–all the runners mags talk about the first 2-3 K— that pretty well everybody needs to go–so you either run into the bushes (another recommendation I would be ignoring), or drop out of race and find a can, and rejoin the run with oodles of time added to you…….I just hope the next run has better arrangements!!! Anyhow—I ran 1:02–and didn’t have one word uttered by my colon! So—tried this for next 10 k– and it worked again! I just hope third time lucky too!!! My son just did this for his first 10 k and it worked—he ran it in 42 minutes—pretty proud here!!! Previous Previous post: Blood Clots – No, not from the hoohah… in the leg and lung! Next Next post: KIDS AND FOOD! What are we doing to them? ?